By experimenting on close friends and having a large supply of cold libations I’ve developed an easy and convenient way to prepare the best spicy chicken wings you will ever eat! Here’s how I do it – wash and cut the chicken wings in half, separating them at the joint (they’re easier to eat this way). Place wings in a bowl and cover with Uncles Dougies Marinade for 10-15 minutes. Mix occasionally so they are well coated. Place wings on a 1″ deep cookie sheet and pour remaining marinade from the bowl over the wings. (On cookie sheet, wings should be half-way submerged in marinade). Bake at 400 – 450 for 60 minutes. Drain the juice and bake to desired crispness. Usually 20-30 minutes more. (We like them well done). The bottle has a funny looking chicken head with smoke coming from its beak. No where, ANYWHERE on this label does Uncle Dougie’s claim any type of heat level. It’s just Chicago Style; not hot, super hot, mild, medium, extreme, etc What’s Chicago Style? A marinade made 35 miles from Chicago is considered Chicago Style. And this is the ONLY Chicago Style marinade around. Can you make a marinade in Boston and call it Chicago Style? No. Once again, I decide to follow Uncle’s directions to the tee. I usually make my wingslike THIS, but not in this case. Instead of a 9 minute frying time, it looks like I’ll have to bake for 1 1/2 hours. I still had to do a little butchering of the chicken skin. Look how much skin can come from only 11 wingettes. I even kept some skin on for the “crisp” factor. I wish they would sell skinned-chicken wings in grocery stores, or at least Whole Foods. Half the bottle was gone after I poured enough to cover the wingettes. (((Yes, that’s La Piara Tapa Negara in the background….it has 20% more gratis.. and if you hit that site check out Cola Cao, it’s so much tastier than Hersheys)))!!! I took Dougie’s advice and grabbed a cold liberation a Yuengling. This Lager, by America’s Oldest Brewery, is my favorite chicken-wing-waiting drink. This gives me some time to taste Uncle’s marinade straight from the bottle. booyah! It’s tastes like an ever-so-slightly spicier Frank’s Red Hot. Tastes fine, not impressive or unique; just fine. I can definitely taste the malt vinegar, which is vinegar produced from barley cereal grains. (After the grains are soaked they release active enzymes that digest the starch, converting it into sugar and thus malt. It’s then aged in oak barrels for several months.) Malt vinegar is VERY assertive, and is not usually used in delicate sauces. Of course, this is a marinade, not a sauce. The marinade, while cooking/baking, went from a rather smooth liquid to a harsh mash before draining. I put the wingettes back in the oven for the “well done” stage, but after 8 minutes too much burning (crappy) smell was filling the room. So my nose tells me it’s time to come out. The wings look really appetizing coming out of the oven and on to the plate. Well now. I understand the meaning of Chicago Style. First, the chickmeat comes off the bone like an over cooked rib. The texture of the meat is altered into pulled-pork like texture. Second, they’re spicy – a good spicy a malty spicy. I’ve made wings in the oven before, and these are better than that time and I’ve had salty wings before, but never malty. Yes, MALTY. I still like Buffalo Style better. After 5 wings, I missed the Natural Chicken Flavor found in these chips. When I eat wings, I don’t expect this texture. And the meat was dry. Very interesting. I didn’t realize that such a transformation could occur from heating chicken wings dry for 8 minutes. Maybe they keep their skins on, and that makes a big difference. Either way, I’d have to say I’d probably like buffalo wing style more, myself. Hey man, if’n you put yer wings in a zip-lock bag for the marinade, you can usually not use so much of yer sauce. Plus you get to squish them about and play. And, “…On cookie sheet, wings should be half-way submerged in marinade.” So you’re going to use a bunch with the recipe. Thanks for trying our marinade…a little history… after having the original “Buffolo Wings”…deep fried wings, rolled in Tabasco, dripping and messy…loads of fun…they were Tabasco heat and needed to be washed down with many cold beers…I started messing around with wings…they needed more dimension and character. I wanted to stay away from deep frying and the wings needed “lots” more flavor. Like the label states, I experiemented on friends and family until it was finally put in a bottle and to the shelf. Couple things to try…the cooking instructions on the label are intended for(everyone, kids included)mild heat. Try not draining the marinade, cook longer and roll & turn the wings often as the marinade thickens. The longer you cook and turn in the marinade the hotter they will be. (If there is any marinade left in the pan, pour it over the wings when serving). This also gives you the opportunity to make 2 pans, one hot the other mild…and all your friends are happy and they drink all your libations and never leave. One other thing…we make a product called Grub-Rub with a Bite. A shake on – rub in seasoning. If you really need to add some heat, this will do it. Add some before serving the wings…or add it while cooking. This marinade is awesome! I don’t usually remove the skin, and I think it might have turned out even better if you left them on. My guests always love the option of baked wings over fried, and often tell me that these are their favorite (of about 5 different types, mostly fried)! They are much easier to make, and less to clean up, when compared to frying. Obviously, I’m a big fan…I even went so far as to pick up bottles of the marinade during business trips to Chicago, smuggling them back in my suitcase, 3 at a time! I’ve gone through 8 bottles and just ordered 6 more, hahaha, good stuff!! Where can you buy Uncle Dougies Wing Sauce on the South Side of Chicago? Thanks for the help. First, I’d also like to know where to buy the marinade but in the NW suburbs of Chicago. Jewel used to carry it but now I can’t find it. Secondly, we love to marinate pork chops in Uncle Dougies and then grill them. They come out tender and juicy – even really thick ones. I use just enough to coat them on both sides and then refrigerate them for several hours. A bottle lasts a long time but now I need more. I couldn’t find an Uncle Dougies’ web site so please help! Elaine, we carry Uncle Dougies. We’d be shipping from Canada, if you’re interested, and can’t find it down south anywhere close. I live in south suburb of Chicago and love “Uncle Dougies Grub Rub with a Bite”. Please let me know how I can purchase more. I can’t find in any stores. I have contacted the Uncle Dougie website twice about where I can buy Grub Rub with a Bite in the southwest area of Chicago but didn’t get a reply. You can order all of their products from their website but the shipping costs double the price. The original Grub Rub is carried at DiCola’s Seafood, 108th & Western. 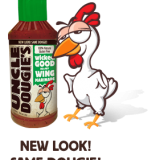 Is there a store in Dallas that sells Uncle Dougies Chicago style wing sauce? It’s no longer available in Albuquerque. I grew up eating wings with Uncle Dougies products… The reason is because I lived a few houses away from the guy that invented this stuff… Ya a small town about 45 minutes from Chicago. My parents used to bake them in the oven then throw the wings on the grill for a bit. I think thats the best way to make them.. So Tasty and tender. I’m 23 now and it’s still a treat when I eat wings with Uncle Dougies. Great flavor and perfect kick. Makes my mouth water whenever I open a bottle..! After 20 years of experimenting with different wing sauces and marinades, I finally came across Uncle Dougie’s and have never made wings another way again. The fact that you don’t have to fry them is it’s most intriguing factor because it is so much healthier for the consumer. In regards to distributers, I know Uncle Dougie’s products are sold in Whole Foods, Lettuce Entertain You, Jewel, Sunset Foods, Pete’s Fresh Market, Woodman’s Market, and Heinen’s. They now sell BBQ sauces, hot sauces, rubs, marinades, and Blood Mary mix (my favorite). Love this stuff. I buy a package of chicken parts on the bone (I prefer thighs), put them in a gallon Ziplock bag with Uncle Dougie’s, then grill it low and slow, just off the direct heat, for 60-75 minutes. I just eyeball the meat to know when it is done. I do not take off the skins and I think that’s really important with Uncle Dougie’s. I have now moved away from Chicago and will have to order online.